Times Square is all about sensory overload. Even during daylight the cacophony of lights and video are enough to give a person vertigo. Thousands of disoriented and staggering people whip their heads up & down and to & fro taking in any and everything. Advertisements flash and beckon from the sidewalk up to the sky. Spotting themselves on the jumbotron, visitors wave frantically to big brother. They squeal and scream in disharmony with ticket hawkers and coupon dealers. Underneath their sound is the white noise of traffic, preaching and ranting. Yesterday the chaos of sound was silenced and the sight was undistracted for several minutes when a couple of hundred of us raised our hands in synchronicity and protest of gun violence. We held up our hands for 26 seconds, each second representing a victim in Newtown. Instantly the crowd was silenced. We slowly sank to the ground as our ‘partners’ held their hand over our hearts for 26 seconds, and then outlined our bodies in chalk. Lying on the ground, and hearing nothing, absolutely nothing was more realism than most of us bargained for. It was the subway rumbling underneath that reminded us to get up and chalk our partners’ body. We wrote inside the body outlines. ; “Crisis” “Boy” “Joseph” “Glock” “Emilie age 6” and quickly dispersed. Making our way through the tour groups and Elmos we looked back. 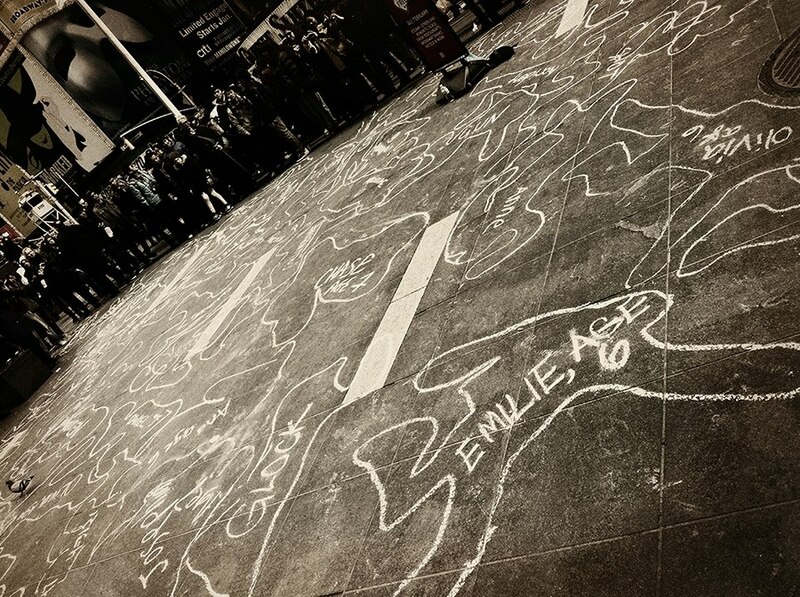 The ground was covered with chalk outlines in a chilling and strangely beautiful tableau. On the perimeter of the ‘performance space’ the assigned police officers still solemnly stood. Moments before the start time they had asked for their friend’s name to be chalked into an outline. Thank you to ART=AMMO for organizing this event.